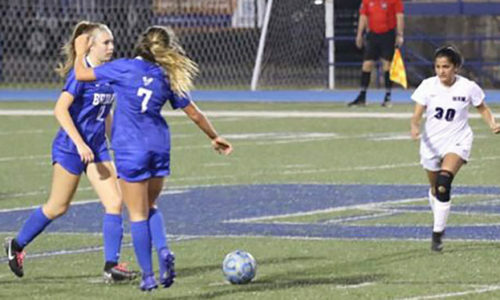 NORTH LITTLE ROCK — With a tiebreaking shootout looming, Ashton Inman, off a cross from Melinda Hernandez, drilled a shot on goal with less than a minute remaining as the Bryant Lady Hornets remained unbeaten with a 2-1 win over the Lady Charging Wildcats of North Little Rock on Friday night. Now 8-0 overall and 6-0 in the 6A-Central Conference, the Lady Hornets are ranked No. 1 in the state and number 26 in the nation going into a first-place showdown with Conway at home next Tuesday. Conway improved to 6-0 and 9-1-1 with a 2-0 win over Mount St. Mary Academy on Friday. North Little Rock’s Rylee Ellis tied Friday’s match 1-1 on a penalty kick with 5:53 left to play in the contest. It was just the third goal the Lady Hornets have allowed all season and snapped a shutout streak of seven halves in a row. “We played poorly and almost ended up in a shootout,” Inman stated. The first half was scoreless until, with 3:56 left, Alyssa Fason found the range off a feed from Hernandez. Keeper Addison Funk finished with four saves. Bryant had four corners and North Little Rock two. The Lady Hornets took 21 shots.